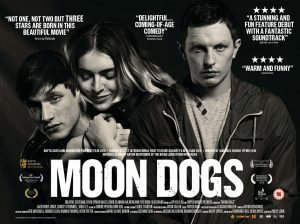 UK, London: Monday 26th June 2017 – Today Amber Content, Up Ha, Clydebank Films and Ripple World Pictures are delighted to announce that UK/Irish Co-Production MOON DOGS will be released in UK and Irish cinemas from 1st September. MOON DOGS is directed by multi BAFTA nominated, multi-award-winning director / screenwriter from South Wales Philip John, written by Derek Boyle and Raymond Friel, produced by Kathy Speirs and Co-Produced by Suzanne Reid, Dominic Wright and Jacqueline Kerrin with the support of Creative Scotland, Ffilm Cymru Wales and the Irish Film Board/Bord Scannán na hÉireann. Brian Jonestown Massacre’s Anton Newcombe became involved in the film’s journey in February 2014 and not only composed Thor’s music but also the original soundtrack for the film and is responsible for providing a score which is both exciting and moving, and is an embodiment of the celebration of the spirit of rebellion.